The Order of Nine Angles is a secretive esoteric – Occult – association whose primary esoteric concern is the interior change of selected individuals by means of particular Occult methods and Arts, and which Occult methods and Arts form part of our particular esoteric Way. This esoteric Way is manifest in our ethos, our mythos, and our methodology/praxis. By esoteric association we mean the informal world-wide collection/community of individuals and clandestine cells/nexions who have chosen to adopt/use our ethos, our mythos, and our methodology/praxis. Occult Orders such as the ONA primarily exist and are maintained over causal Time in order to facilitate and encourage the discovery and the use, by individuals, of lapis philosophicus: that is, to facilitate and encourage the interior, personal, alchemical, change in those individuals such Orders have clandestinely recruited, or in such individuals as have succeeded in finding such Orders and overcoming the various obstacles placed in their way, or in such individuals as have chosen to adopt/use/adapt our ethos, our mythos, and our methodology/praxis. Our Occult praxis includes (i) The Seven Fold Way of initiate training – as described in freely-available manuscripts (MSS) such as The Requisite ONA and The Sinister Abyssal Nexion; and (ii) particular Dark Arts such as The Star Game, Esoteric Chant, sinister tribes, and adversarial (heretical) tactics. (c) our acceptance that it is primarily by pathei-mathos [by learning from direct practical experience, from tough challenges, and our mistakes] that we acquire the necessary personal judgement, the knowledge, and the experience (esoteric and exoteric) to truly liberate ourselves from the constraints imposed by others and imposed by some external supra-personal authority or authorities. Our mythos is evident in legends and stories regarding The Dark Gods, in our aural traditions such as those of the Rounwytha, and in our ontology of causal/acausal. In O9A ‘esoteric-speak’ the Order of Nine Angles is a type of nexion; a collocation of human beings connected over durations of causal Time in particular ways who, by virtue of being kindred both esoterically and exoterically maintain and expand their acausal presencing over such long-durations of causal Time. Such an esoteric Order with such an Aeonic perspective produces both internal and external change in an affective, sinisterly-numinous, way. That is, we not only change a limited number of individuals, personally, individually, by our Occult Arts, over long-durations of causal Time, but also – because we are redolent of Wyrd, of the sinisterly-numinous – we directly and indirectly influence others, greater in number than the number of our initiates, by our very existence, by our ethos, our methods, our philosophy, our mythos, with some for example adopting and adapting some of our praxis, some of our Occult Arts, some of our esoteric philosophy, even those some or many who do this may not acknowledge or may not even be aware of how the O9A has influenced them. What are the aims of the ONA? (3) to aid, encourage, and bring about – by practical and esoteric means (such as Dark Sorcery) – the breakdown and the downfall of existing societies, and thus to replace the tyranny of nations and States – and their impersonal governments – by our new tribal societies. How can I join the ONA? To be or to become an ONA person involves a life-long commitment to personal, esoteric, and Aeonic change/development/evolution. This change can be guided or unguided. In both cases, ‘membership’ is earned not given, for the individual becomes of the ONA by their practical deeds, because of their years-long esoteric experience and learning, and because of their use (and development/enhancement) of our Dark Arts, our praxis. The unguided (individual) way, is to, by yourself, just start living by our code of kindred honour and using our Occult system of training as manifest, for example, in (a) our Seven Fold Way [qv. freely-available texts such as The Requisite ONA and The Sinister Abyssal Nexion] or in (b) our adversarial/heretical praxis. The guided way is to seek out a traditional ONA nexion or an ONA Adept – or to be recruited by an existing ONA Adept or nexion – and then follow or apply or put into practice the guidance and esoteric training that may be offered. Note that in both these cases, the individual – when sufficient practical experience (esoteric and exoteric) is acquired – can establish their own independent ONA nexion (aka Temple aka group), if they so desire. In both cases, one does not join – or pay membership fees to – some central ONA headquarters, or some ONA command, because the ONA is organized, in the mundane world, on the basis of (i) independent cells (which are often or mostly clandestine), and (ii) independent individual operatives (who often or mostly operate clandestinely). I have heard it said that the ONA is defunct or never existed as a real Occult group. The confusion about being ‘defunct’ arises and has arisen because (i) the ONA is an Occult association operating on the basis of mostly clandestine, independent, cells and operatives, most of whom do not have and do not want an overt (public/internet) presence, and (ii) the ONA is a shapeshifting entity, in the world of the mundanes, and has employed and sometimes does still employ a variety of tactics to confuse, to test, to jape, to presence the dark, to select, to divert attention. Thus the ONA does/does-not exist, never has existed, and is/is-not defunct; or is/was merely an urban myth; just as we are/are-not a confusing, dark, labyrinthine, satanic, entity. Over the decades, a select few ONA people have – wanted or unwanted – acquired something of a ‘public profile’ and are thus known for their past or their current or (more usually) for their alleged/assumed association with us. One or two of these ‘known associates’ may well have been guided/trained by ‘Anton Long’ just as ‘Anton Long’ may or may-not be (or have been) one person or many people. Some people – correctly or incorrectly or japingly – have considered or do consider or have stated or do state that the ONA is or may be nothing more than an outward exoteric manifestation of the life-long practical Occult/sinister quest of this ‘Anton Long’ and thus re-presents his accumulated insights and experiences and the techniques/Dark Arts he has used, perfected, and/or developed – from the stage of Initiate to that GrandMaster. But – as with so many ‘things ONA’ – it is up to, and necessary for, each and every individual to judge these matters (and thus the ONA) for themselves, and/or use (or to develope and then use) certain esoteric – Occult – abilities and so discern the veracity or otherwise of such things and the usefulness (or otherwise) of the ONA and its mythos/praxis/ethos. Being a living hereditary repository of a certain type of knowledge, esoteric and otherwise – that is, being akin to an ancestral, communal, pathei-mathos – the ONA grows and slowly develops as more knowledge and understanding are obtained, as more individuals undergo pathei-mathos, and as newer Dark Arts are developed. But the Occult essence – the ethos, the internal alchemy of individual change during the life of the individual, the individual discovery of lapis philosophicus, the Adeptus way, the Aeonic perspective – remains. I have heard it said that publicly available ONA texts often contradict each other, and also that for every ONA manuscript you can find, there is another somewhere which contradicts it in whole or in part. Something of an exaggeration; but yes there are some real and/or apparent contradictions, although what some consider a contradiction about something or some topic is usually only us either (i) presenting or offering (sometimes within the same text) an alternative viewpoint, or (ii) us acting as our own ‘Devil’s Advocate’. Why? Because as we have said/written for some forty years, we (i) expect people to work things out for themselves, and thus use or develop their own judgement, and use or develop their own esoteric abilities, and (ii) we sometimes do use and have used a variety of tactics to confuse, to test, to jape, to select. Those who understand the how and the why of all this, do. Those who do not, are not of our kind or cannot transform themselves into our kind, lacking as they do an inner Baeldraca and/or certain necessary esoteric abilities. How can I tell a genuine ONA person from a fake? By using your own judgement and by using (or by developing and then using) certain esoteric – Occult – abilities. Furthermore, a genuine ONA Adept is someone following the Seven Fold Way and so will have performed several Insight Roles, accomplished certain physical tasks, and undertaken the Rite of Internal Adept. They will also have built and mastered the advanced form of The Star Game as well as mastered and performed Esoteric Chant. They should be able to demonstrate such skills and/or have (usually private) documentary evidence of such, for example their Internal Adept journal, and photographs of their hand-built advanced Star Game. What do you mean by mundanes? We mean any and all of those who “are not of us”. Those who do not belong to or who do not associate with our sinister tribes, our traditional nexions, or who do not share our sinister ethos, or our sinister way of life. We call them mundanes, because that is what they are – mundane. They are ordinary; they engage with and live in the mundane world of everyday work, and they have mundane goals. They accept the status quo; they pay their taxes. Even the ‘rebellion’ of some of them is no real rebellion against the mundane ethos of wage and salary slavery, no real rebellion against the laws and ethics of the mundanes, of The State; no real rebellion against The State itself, and against the organized forces of mundane ‘law and order’. The fundamental difference between us and mundanes is that we demoniacally aspire to be more than we are, and we are or we aspire to be tribal and/or individualistic. In contrast, the mundanes seek safety and security and the ‘order’ that comes with Police forces and with State or government-made laws, and with large, organized armed forces. They also accept impersonal Courts of Law where some abstract, government-made so-called ‘justice’ is said to be obtained. In contrast, we accept that the only law is the warrior law of personal honour: that we are responsible for ourselves, that we have a right to the natural justice of revenge, retribution, a fair fight, and personal duels; and we refuse to surrender this responsibility of ours to anyone else or to any organized force, or forces, of mundane ‘law and order’, such as law-enforcement agencies or government so-called Courts of Law. Thus, we accept that our tribes and clans and nexions have the right and the duty to make their own laws, to dispense their own justice, to defend themselves with deadly force, and to have, if they so desire, their own territory where they are the law. If they want to co-operate with others, it is their decision – and cannot be imposed upon them by some outside agency or by some abstract law. Thus, we accept that we can only give our loyalty to someone we know personally, and that we have a duty to be loyal to our kind, to those of our ‘family’, to those of our kindred, our tribe. And we would rather fight and die than surrender to any mundane or allow any agent of a government to take away our honour and our dignity. And so on. Mundanes do not like this genuine individualism; this tribalism; this proud ethos of personal honour and practical, natural, justice before, and above and beyond, and in place of, State/government, law. You talk of a Dark Imperium – a kind of Galactic Empire. But isn’t there a contradiction here between the goal of developing unique individuals and an Imperium which by its nature requires a certain loyalty and obedience, a certain submission to its ideals? In its beginning (and for probably many centuries), such a sinister Imperium may well involve our new, aristocratic, elite (our developed individuals) in leading those less developed and less enlightened; and/or in manipulating people, perhaps by some causal form (for example, what mundanes often call a political ideology, or say, what mundanes often call a religion). Thus, our Dark Imperium may well be built and established by others, but under our guidance, our leadership; under the inspiration of our numinous-mythos, and under the aegis of our new type of human being. But it is this very Imperium which will provide the challenges, the Cosmic diversity, to speed up the process of human evolution and thus produce more enlightened, unique, individuals who can fulfil their potential, as has been explained in various texts. Hence, the Dark Imperium will be our new sinister collective, assimilating other humans and then possibly other alien life-forms – a manifestation of our sinister ethos; a means to test, refine, evolve, individuals; to have the best triumph and lead; to provide more opportunities for evolution, not less. In addition, our overall aim is to produce individuals with an Aeonic perspective, an understanding of wyrd, of the sinister imperative, who thus understand our new tribal ways of life and thus the ethos of our Law of The Sinister-Numen. Our aim is not to produce more Homo Hubris types who are addicted to an egotistical way of life and who thus are arrogantly unbalanced, believing as such types do the Magian illusion (evident in Magian Occultism) that they – some puny mundane – are the most important (and the most powerful) thing in the Cosmos. Our Way – in contrast to such Magian egotism, in contrast to the un-numinous hubris of Homo Hubris – is the Way of the Law of The Sinister-Numen, and which Law is the foundation of the Dark Imperium, and the basis for the way of life of the warriors of our Imperium. Is the ONA a Satanist organization? The ONA is not just ‘satanic’ because even traditional Satanism (a term we first used, some decades ago, and now appropriated by others) is only one particular causal form linked to one particular Aeon (the current one). That is, it is only one means, one way, of currently presencing The Dark Forces; of provoking change and aiding our evolution, individual and social. That is, Satanism is but an exoteric (or public) form of the current Aeon – an outer shell which just encloses, or which can enclose/contain, some particular sinister, acausal, energies in a certain span of causal Time. Of course, most who today profess to be ‘satanists’ will have no idea what we are talking about here, which is one reason why they are still mundanes. Thus, we tend now – in this the Third Phase of our sinister, centuries-long, Aeonic strategy – to use the term sinister instead, to describe ourselves, and the ONA itself. Hence, we now describe the New Aeon that we seek to bring-into-being, by our practical subversion and our dark sorcery, as a sinister Aeon, rather than a Satanic Aeon, since the next Aeon will take us beyond our currently limited causal forms (beyond exoteric Satanism), and beyond the abstractions of the mundanes, who so like to pretend they understand some-thing by giving it some label or describing it by some term, some -ism or some -ology. For the reality is that ‘we’ cannot be defined in the simple, causal, way the mundanes want, and need. Are you a theistic Satanic organization? That is, do you really believe that The Dark Gods – and Satan – are real livings beings in the acausal who can ‘presence’ (manifest) in our causal realm? Each ONA individual must discover – find – the answers for themselves, and this requires using (or by developing and then using) certain esoteric – Occult – abilities. Our Dark Arts are one means of so developing such abilities. Where can I find out more about the ONA? Esoteric answer: By seeking, finding, and asking ‘those-who-know’. Exoteric answer: Most of our texts, recent and otherwise, are available either (i) in pdf format and freely available to download from the internet or (ii) as printed books. Some photostatic copies of some original and older ONA items – as issued by the ONA in the 1980’s and 1990’s CE – are also available, again in pdf format. These copies of originals include Naos, and The Satanic Letters of Stephen Brown, and the original Black Book of Satan, as well The Grimoire of Baphomet. Recent pdf compilations of ONA texts include: (a) The Requisite ONA; (b) The Sinister Abyssal Nexion; (c) Marcheyre Rhinings(d) Magian Occultism and The Sinister Way; (e) Excerpta Esoterica; and (f) the three volume ONA Classic Texts. One important attribute of the ONA is that we do not believe in the mundane concept of copyright, so that all ONA works can be redistributed, and re-printed and re-published, with anyone free to print them and even charge money for them if they want to make a profit. Why don’t you have an official website any more? For a short period – of some five or six years – the ephemeral medium that is ‘the world wide web’ served a useful and a particular planned purpose: that of disseminating information/disinformation and mythos, and enabling easy access to ONA MSS and thus to the enformation contained in those MSS. Given such dissemination, and given that our MSS were read and/or downloaded hundreds of thousands of times during that period with many still being available via that ephemeral medium, that particular purpose has been achieved. This plan to use ‘the internet’ on a temporary basis was mentioned years ago in several ONA texts, such as Nasz Dom: The Dark Tradition Continues (published in 115yf). For knowledge is numinous, a part of one’s life, whereas information – that which is presented/communicated by such an ephemeral medium as the world wide web – is lifeless, causal, an outer form. For in terms of esoteric, Occult, matters, to know is both to learn from personal experience and to place what is so learnt in a particular context, that of one’s personal internal and external along the particular life-long way or path that one has, by initiation, chosen to follow. What is the official symbol of the ONA? The second, given below, relates to our sinister mythos, and is associated with Baphomet, whom we regard – in contrast to all other Occultists – as a female acausal and sinister being, who can manifest in the causal, and this sigil is known both as The Sigil of Baphomet, and as The Dreccian Moons of Baphomet. What should be understood, however, is that these sigils are only two-dimensional, exoteric, re-presentations of four-dimensional forms. Thus, the ONA sigil, given above, is properly (that is, esoterically) constructed in three-dimensions, within a sphere, which three-dimensional construct itself changes, thus mimicking the change which is causal Time. This change is both a simple change of perspective (for example, the movement and rotation of the sphere and the construct within it) and also a “mapping” (that is, a causal “distortion”) of both the sphere and the construct within it). This mapping is essentially a change of, a transformation of, the regular Cartesian three-dimensional co-ordinate system, and to a limited extent this can be understood, and re-presented, by reference to the mathematical change of metric in causal Space-Time. 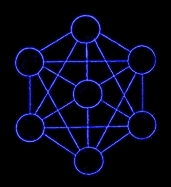 This change is – viewed causally – random, and thus there is some esoteric appreciation, on viewing this four-dimensional sigil, of some of the properties of a nexion: of where the acausal is manifest in the causal. Similarly, both the Septenary Sigil and the Sigil of Baphomet should be constructed in three-dimensions, and be animated. What is the true origin of the name Order of the Nine Angles? The Order of Nine Angles is only our exoteric name, and the origin of the term Order of Nine Angles – or as some people write, and, say, The Order of The Nine Angles – has been explained by us, several times. See, for instance, the collection of texts, The Meaning of The Nine Angles, Part One and Part Two issued in 120 yf in pdf format. There are several other, older, Order MSS where the term is discussed, and those genuinely interested can seek those other MSS out and read them. Mundane Occultists, of course, will continue to make their spurious and silly claims about the supposed origin of the outward, exoteric, name of our subversive organization. Is it true that you advocate human sacrifice? We refer to such deeds as culling, and all genuinely sinister organizations, groups, associations and individuals undertake such cullings, and have always done so. Such deeds – whether collective or individual – are one of things which distinguish our type of life, our breed, from that of the mundanes. Culling is explained in more detail in ONA texts such as Concerning Culling as Art. What is meant by the term ONA iterations? The iterations are an expression of the natural change, the evolution, of the living esoteric being that is exoterically known as the ONA. The first iteration/phase – aka ONA 1 – may be considered to be exoterically manifest in the overt and practical traditional and often strident Satanism of the early ONA (c.1972-1985 ce) with its ceremonial groups, and in Rounwytha nexions all of whom were in the UK and known to AL. The second iteration (c.1986-2009 ce) – aka ONA 2 – was most manifest in the Seven-Fold Way and the praxis of individuals, world-wide, establishing their own ceremonial ONA-type groups/nexions. (d) the development of and emphasis on our individual adversarial praxis and on our evolution of tribal living, based as such modern tribal living is on our ‘the law of the sinister-numen’ aka The Code of Kindred Honour aka The Dreccian Code aka Code of Sinister Honour aka the Law of The New Aeon. All iterations – past and present – although different in character co-exist within the ONA, just as a mature living being has within it the younger being from whence it matured. I’ve heard that your Dark Gods are taken from the fiction of HP Lovecraft. Is that true? That is a common and mistaken assumption made by mundanes. A study of our tradition will suffice to show that the esoteric mythos of The Dark Gods is quite distinct from, bears little or no resemblance to, and is vastly more comprehensive than, the un-esoteric pseudo-mythology of Lovecraft. See, for example, the ONA text Pseudo-Mythology and Mythos: Lovecraft, The Dark Gods, and Fallacies About The ONA. In contrast to pseudo-mythology of Lovecraft, The Dark Gods (aka The Dark Ones) are part of a distinct, and unique, ontology and Occult praxis, as well as being part of our complex esoteric philosophy which addresses ethical, etiological, epistemological, and other philosophical issues. How can I contact someone from the ONA? The simple answer is that you cannot; unless we want to contact you or recruit you for some reason, because – for instance – you had some particular esoteric ability or some practical skill which we, or one of our traditional nexions, or one of our tribes, or one of our adversarial operatives, might find useful. Even then, of course, you would be tested, and would remain untrusted until you had been blooded (British English) or hazed (US English) and taken a binding oath of loyalty unto death to your new ‘O9A family’.